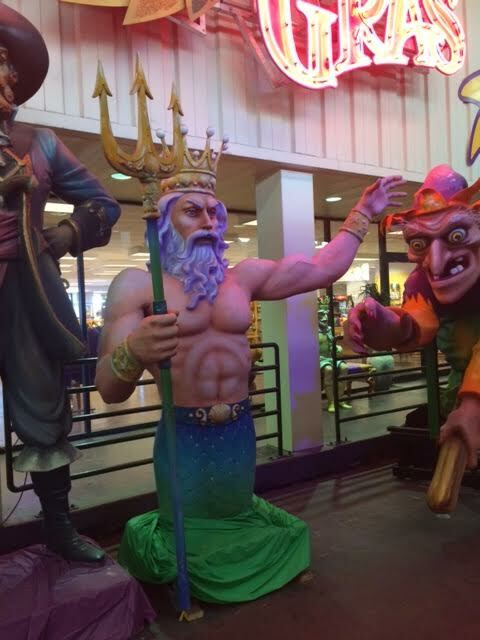 I had the absolute pleasure of taking a trip to New Orleans last week and in this trip, I was lucky to get a chance to check out Mardi Gras World. 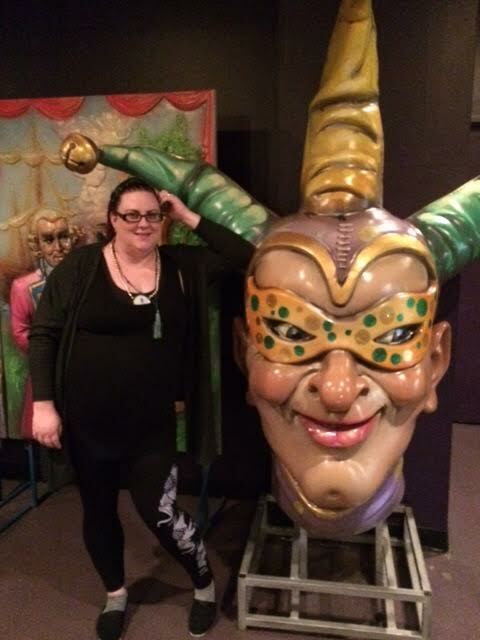 Being that I have never attended the annual Mardi Gras celebrations held here in New Orleans, I figured that getting a chance to see how it all happens before the time comes in February would be extremely exciting and I must say, the trip to Mardi Gras World did not disappoint. When you first enter, there is a line of previous years float props to greet you as you head into the gift shop, which is pretty sizeable and perfect for picking up a little piece of NOLA for folks back home. I really enjoyed seeing these large props and could practically hear the faint cheers of past years as I walks past them. Since I am a lover all all things ocean, my favorite by far, in this little line up was the King Triton. 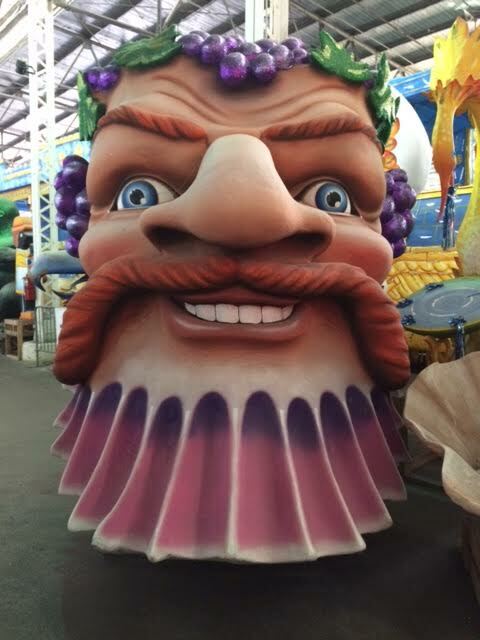 The good news, is, Mardi Gras World is constantly changing so you can see different things every time you come here. 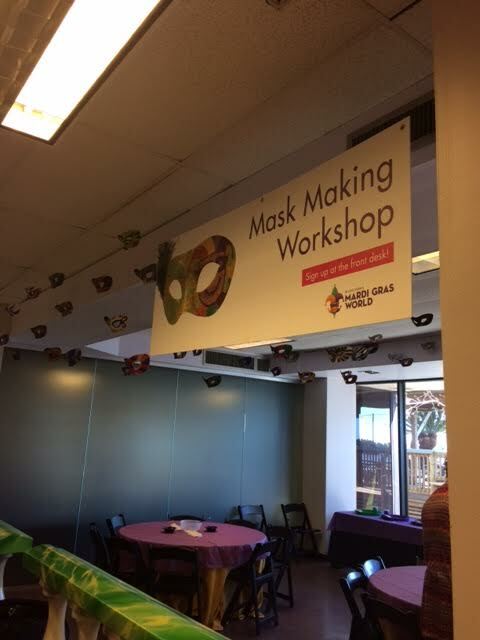 Inside the gifts shop, there is a Mask Making Station that is perfect for renting out for parties or you can simply make one of your own after a tour. 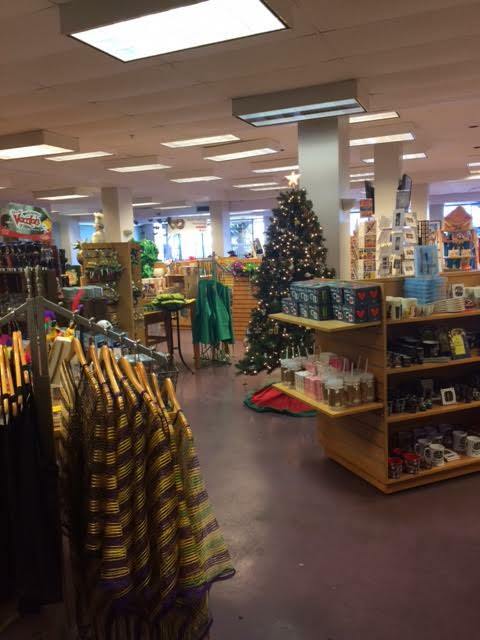 A tour for groups can be arranged, however they also offer tours with a per person price of $19.95 for Adults, $15.95 for Seniors, Students (with ID) $15.95 and Children (2-11) are $12.95. 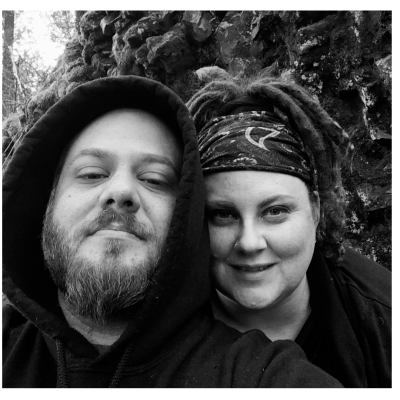 I took the tour while there and here are some of the highlights, below. 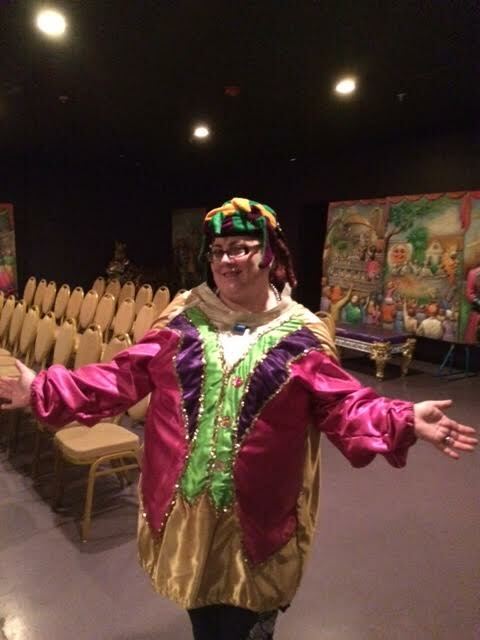 At the beginning of the tour, we were led into a room with seats to watch a short video on the history of Mardi Gras. Right before we watched, we were allowed to walk around the room and take pictures with props as well as try on Mardi Gras Costumes and Hats. This would be a ton of fun for kids, I think! The video was very informative and I learned a lot of things I did not know about Mardi Gras, both current and past history. Being that I love cake of any kind, I was thrilled when we got to try some King Cake, a Mardi Gras tradition. 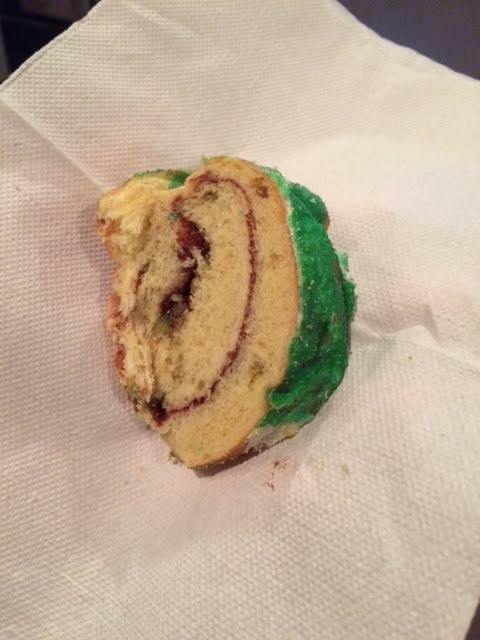 The King Cake tasted like a cinnamon roll to me and I loved it. The King Cake, if you don’t know the story of it, is made during Mardi Gras Celebrations and is served decorated with the three Mardi Gras Colors of purple, gold and green. Inside, after baking, a small plastic baby is inserted into the cake and whomever gets the baby in their piece is then given the honor of hosting the next party and making a King Cake to share. Moving on from the delicious King Cake, we headed into the room where all the beautiful props are made. I was very happy to find out that they often re-use the props and turn them into something or someone else. This cuts down on time and waste. 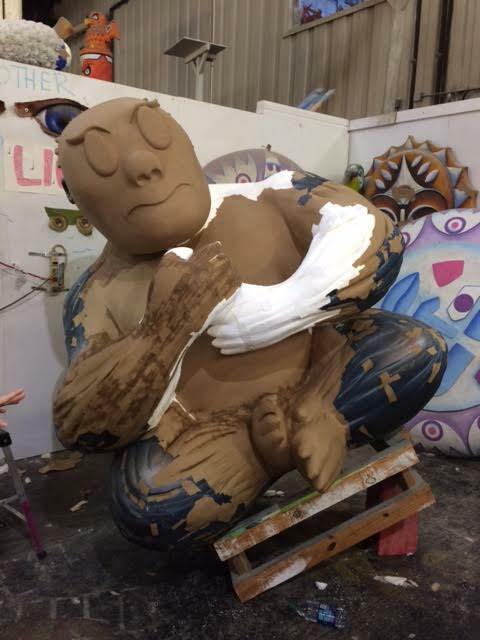 Many of the props are now made with Styrofoam and covered in paper mache before being painted. As we left the room for making the props, we headed into the warehouse where floats are made. 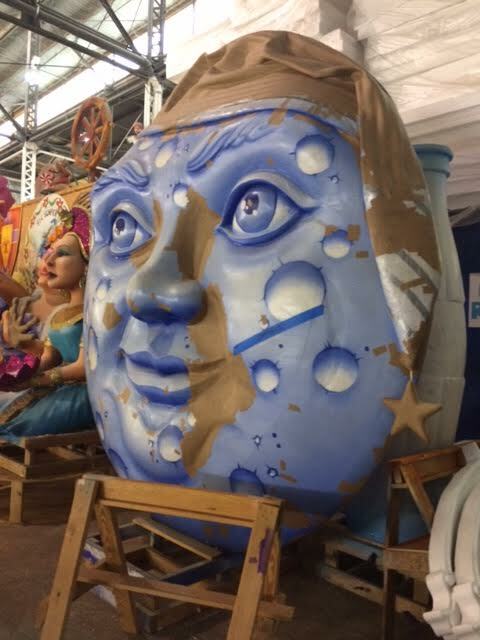 These floats are massive and often there is more than one float attached to the others. They parades are so long, they even have bathrooms constructed in the middle of them! 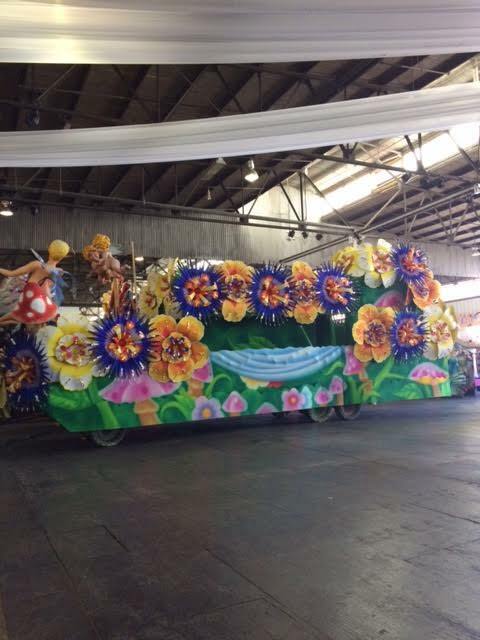 Each float is manned by a Krewe (pronounced Crew) and these Krewes are like a family. They spend thousands of dollars PER float of their own money to hand out gifts to parade go-ers. They are required, by Mardi Gras Tradition, to wear face masks to hide their identity. 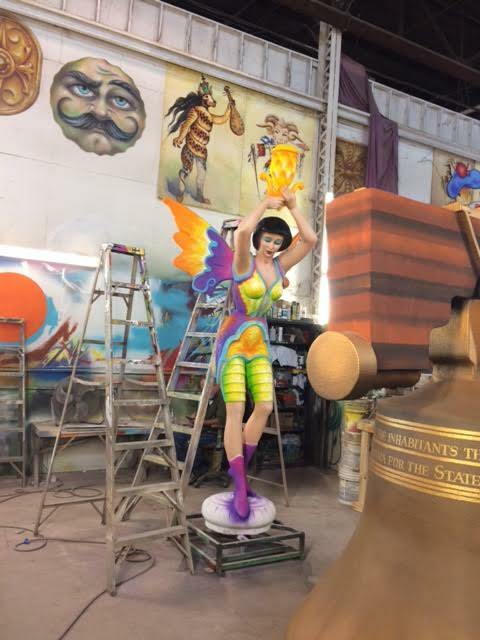 After seeing the huge floats, I was really interested in the next and final part of the tour- The Pixie. 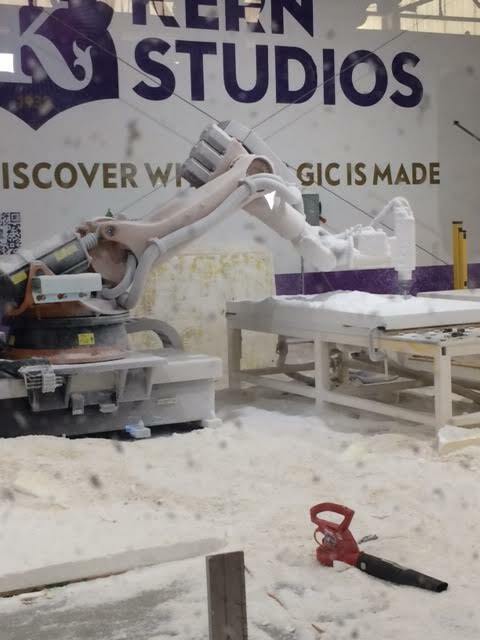 The Pixie is a robot that helps modernize and speed up the process of creating many props, especially for corporate accounts that Mardi Gras World holds with other businesses. It was fascinating to see this robot arm cut out all of the little intricate details. 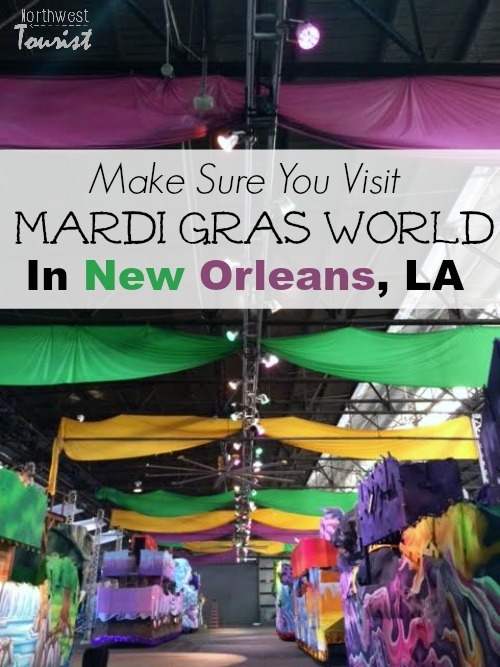 If you are going to be in New Orleans, make sure you check out the Mardi Gras World tour for a fun and cultural experience for the whole family. They also have a free shuttle that takes you from certain points to Mardi Gras World as well so this makes getting there super easy! 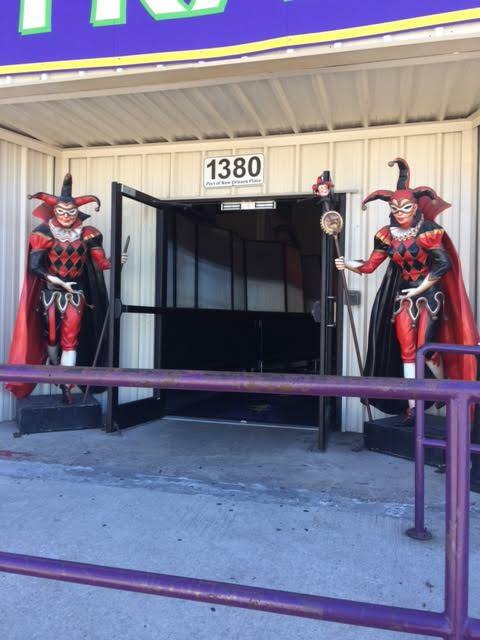 Mardi Gras World is located at 1380 Port of New Orleans Place, New Orleans, LA 70130. You can also take the street car there as well! Hours of operation: 7 Days a Week, 9 am – 5:30 pm with tours leaving every half hour. Tours are approximately 1 Hour Long.